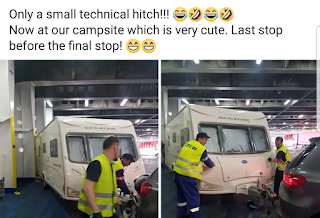 I’d never driven a caravan before never mind drive one across Europe! Why did we decide to do this? Last year we managed to find cheap rental accommodation for the summer season while Nicos worked on the Lady O with his partner Dennis, but this year was a different story. The only cheap rental accommodation we could find was either for the winter months or for the whole year. We contemplated renting for the whole year; it could be a base and a place to leave our belongings. 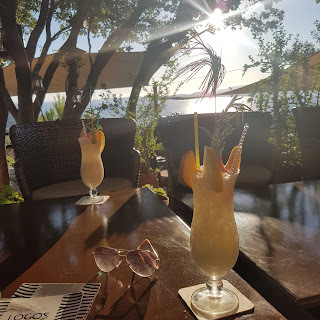 After all, eventually we plan to stay in Kefalonia forever so renting all year round would definitely be something we would be looking to do in the future. But for now it felt unnecessary. We only needed somewhere to stay for 4 months. So we began to look at our alternatives. We could stay on the Lady O but for me this wasn’t an option. So we decided to buy a caravan! Nicos was very excited at this prospect and began his search online and watched hundreds of YouTube videos! By chance we found one around the corner from where we lived. 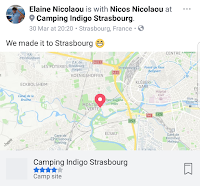 It was the exact spec Nicos was looking for and they were happy for us to keep it there until the day we were travelling (as we had no-where to store it!). PERFECT! There was only one slight problem. Nicos would not be able to drive! He was due to have an operation 10 days before our trip and would need to have his arm in a sling for 4 weeks! Now I do like an adventure, I have a bike license and used to ride a Ducati Monster 695. I have my PADI and I’ve been rock climbing! But drive a caravan across Europe! ‘I don’t know if I can do it,’ was my response. I decided to do my own research. 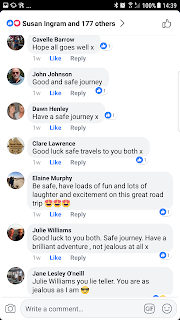 On Facebook (Kefalonia Unplugged and Loving and Living Kefalonia) I asked for some advice from those who had driven a caravan to Kefalonia. I had so many responses and so much encouragement. 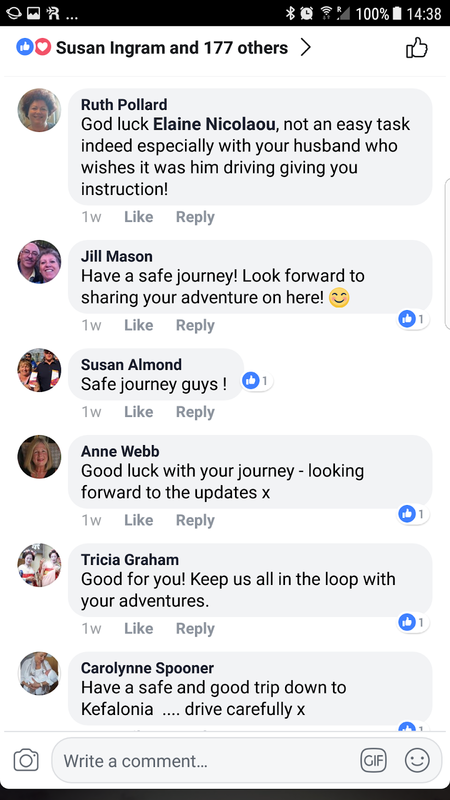 A few people suggested/asked if I would be sharing my journey on Facebook for them to follow. 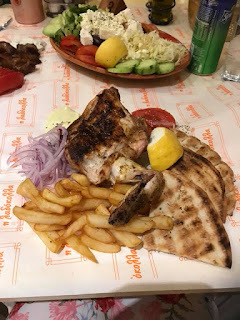 Although I write blogs for Kefalonia Cruise, it didn’t occur to me to post the journey on Facebook. What if it all went horribly wrong? But it was a nice idea and would act as my journal on the trip. The original purpose of the trip was to take the car over and for Nicos to help his partner Dennis get the Lady O ready for the season. But now with his arm in a sling he would be unable to drive or help on the Lady O! Now the sole purpose of the trip was for me to get us their safely. I was going to need all the help I could get! I was amazed at how many people followed with interest and spurred us on. 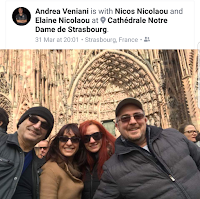 Neither Nicos or myself put too much on our personal profiles as we didn't want to worry our families who were already worried enough and thought we were crazy! 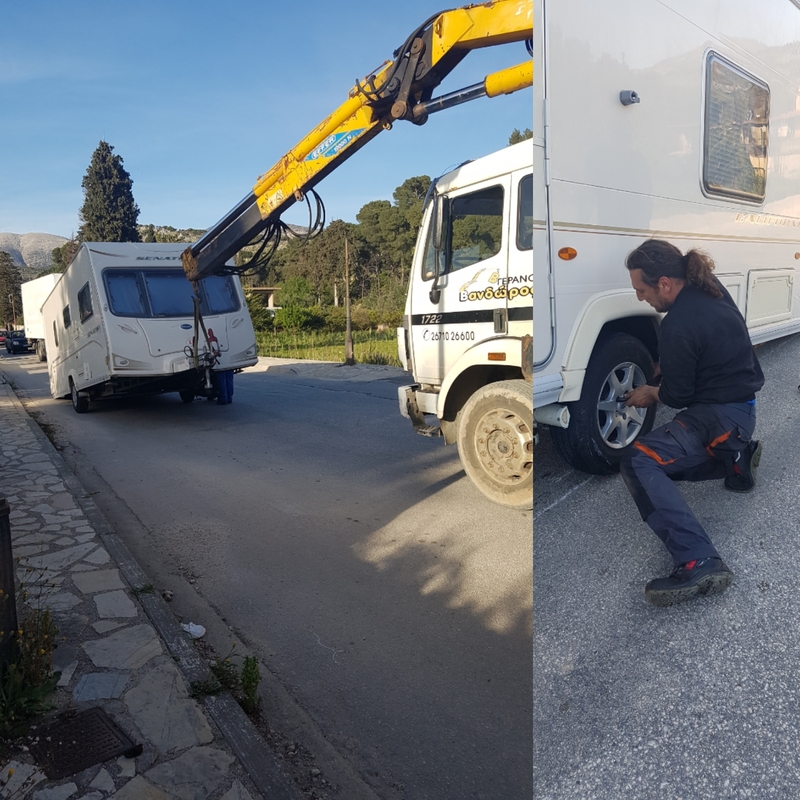 I had one driving lesson towing a trailer a week before our trip to get a feel for what it would be like towing and to learn to reverse. Reversing proved a bit tricky and I had many many attempts before I finally got it right! With the lesson under my belt I began to feel a little more confident that I could do it and I agreed. That didn’t leave Nicos much time to rearrange all our ferry crossings (that had been booked months in advance) to take the caravan over too. The weekend before the trip we packed the caravan and were given a handover pack full of instructions. The caravan was bigger than I had remembered! And with Nicos’s arm in a sling he wasn’t able to do much. What had I agreed to? Was it too late to change my mind? I could feel my anxiety surging up from deep inside me and the days leading up to the trip I was a nervous wreck and very emotional. ‘Counting down the days now. Thursday our road trip in the caravan with me driving begins!!! Feeling excited and petrified at the same time. Spent yesterday packing the caravan and telling Nicos off every 5 minutes for trying to do too much. He hasn’t quite grasped doctors orders to do absolutely nothing for 4 weeks! Not taking his pain killers and wonders why he’s in pain! Men! It’s going to be an ‘interesting’ journey I feel!!! These were the first of many many many more words of encouragement we received. I wish I could include them all, but over the coming days, each time I posted our progress, we received more and more comments. 29th March 2018 - The day had arrived! I finished work early, picked Nicos up, packed a few last minute things in the back of the car and off we went to pick up the caravan. I posted Part 1 on Facebook explaining all of the above, and shared we were about to leave and would post photos and let them know how we’re doing as and when we could. 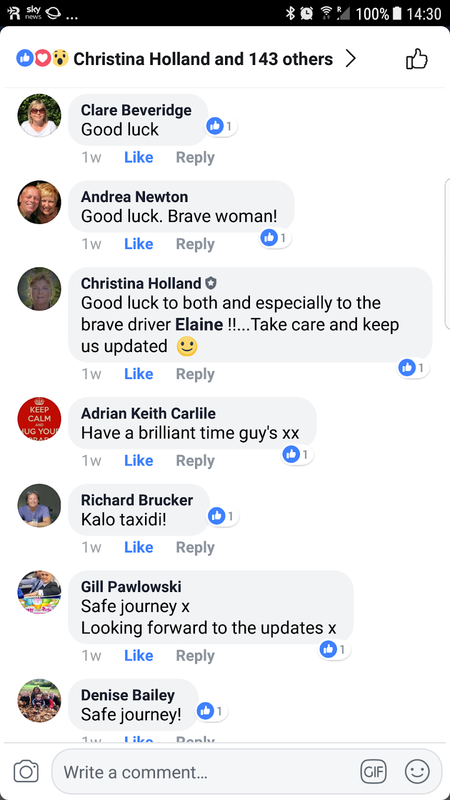 These were just some of the 'Good Luck' messages we received! We made our way to a campsite in Dover where we would get a few hours sleep before catching the Ferry to Calais at 4:10am on the 30th. Driving the Caravan was quite easy I thought! So this is our journey! We missed our ferry this morning due to French passport control but we caught the next one so no big deal! However we learnt some valuable lessons today. 2 hour waiting time at Dover Port! 3. Plan for the journey to take double the estimated time when in a caravan! The last 150 miles was like watching paint dry! It was very painful! For every mile I drove a minute was added to my journey!! Other than that we had a successful day on the road and we have reached our destination. I was very proud of myself and Nicos supported me every step of the way. Apart from breaking a bit too hard a few times, I did well! But he is a retired driving examiner! We will now shower and see if we have energy to go into town. Otherwise it’s an early night with a rest day tomorrow. Looking forward to seeing our lovely friends Sonia and Andrea who are meeting us at Strasbourg tomorrow. 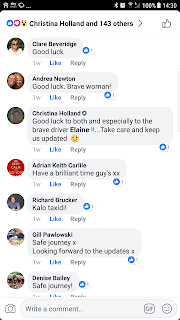 Maria Kinsey – Well done Elaine. You should be very proud of yourself. Go Girl!! Well today is our rest day. It didn’t start off too great. I woke up with a headache and as one of Nicos’s wounds seemed infected, we went to the doctor. We waited an hour to be seen but glad we went as he has in fact got an infection and was prescribed antibiotics. While waiting in the surgery our friends Sonia and Andrea messaged to tell us it was snowing in Switzerland (our route tomorrow!). I’m glad to say the day got better. Nicos and I went into the city and had a lovely lunch and walk about. Sonia and Andrea arrived and reassured us it was only a short burst of snow that then turned into rain and cleared in no time. We visited the Cathedral which is beautiful and went on a little tram (a bit like the one in Argostoli!). 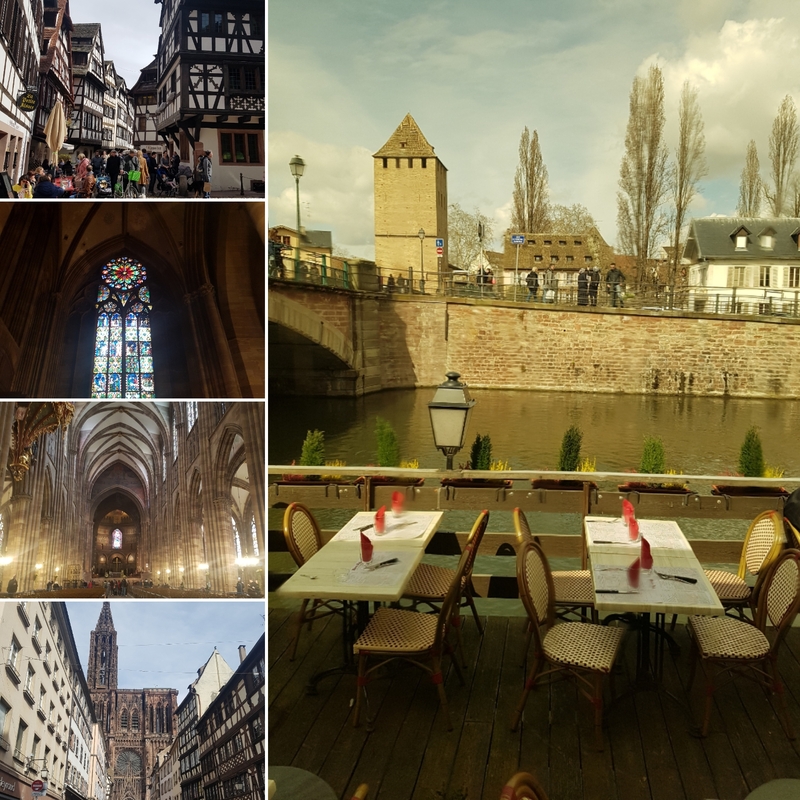 Strasbourg is a beautiful place, definitely worth visiting if you get the chance. We then returned to our caravan for a freshen up and will be going out for dinner shortly. 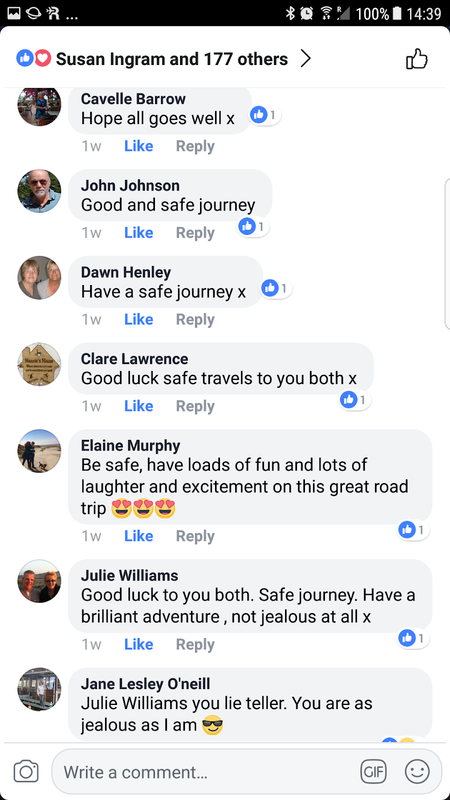 John Simmons – Saw Elaine at the Italian border but was only able to message congratulation. Ruddy great caravan for first time! But Sonia took a video to reassure us that we were doing fine. In total it took 8 hours to reach their home in Pavia. 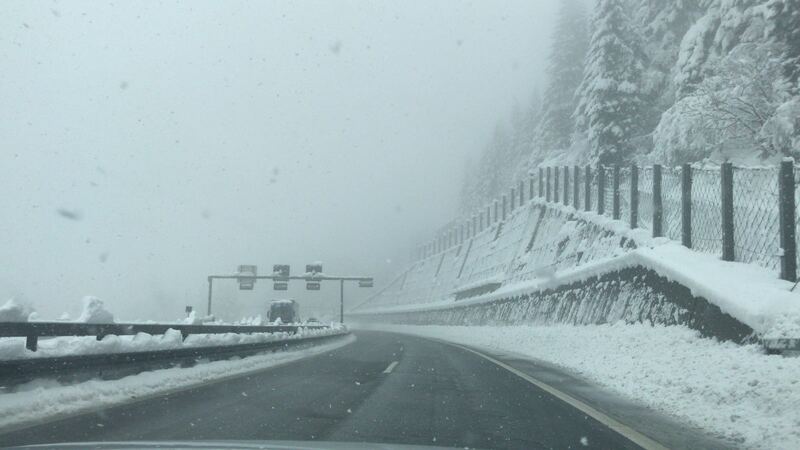 What a contrast in weather we saw in just one hour, from Switzerland to crossing the border into Italy. From cold, cloudy, rainy, windy, snowy to 20c sunshine, blue sky and fluffy clouds. Now at Sonia and Andrea’s lovely home, we will rest, shower and go out for the best pizza ever at Ristorante Milano! 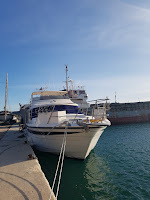 Tomorrow we head for Ancona to catch the ferry to Patra. So we had breakfast with our friends Sonia and Andrea, said our goodbyes and then made our way to Ancona. We passed the time away singing songs, Nicos sending friends and family messages AND I even over took a few cars! On arriving at Ancona we collected our tickets and went to isle 13 to board the ferry. Our timing was perfect. As soon as we got there they started boarding. As we got to the front of the isle our tickets were checked. The man said we didn’t have a ticket for the caravan! 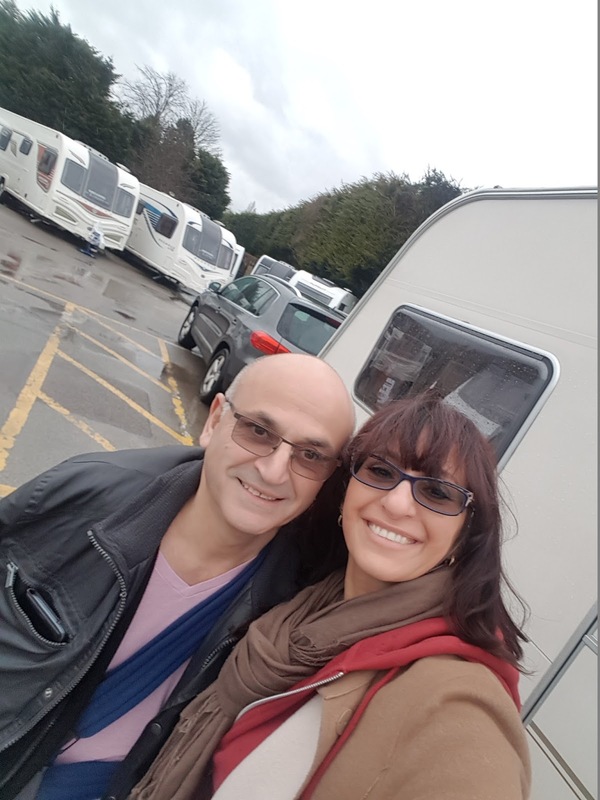 Nicos showed him the paperwork to prove he had paid for a caravan and we were asked to move out of everyone’s way while they checked. We watched the man speaking on the phone to the office for several minutes. Then we were told we had to go back to the ticket office and explain we had ‘lost’ our ticket! Nicos explained that what we had was all we had been issued and we hadn’t lost the ticket. Never the less we had to go back. Thankfully the man was very kind. He jumped in his van and led us to the ticket office and back again so we didn’t have to join the back of the line! 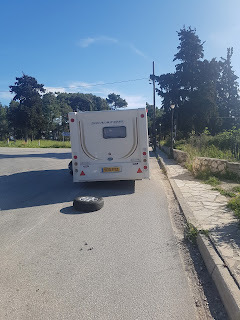 What had occurred was that the caravan had a different reference number as we had added it to our journey at the last minute and it wasn’t issued. 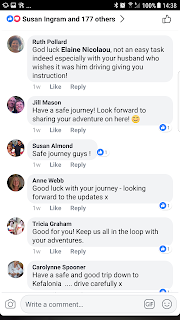 Barbara Young – Hi you two, on the last leg now, bet it feels great!! 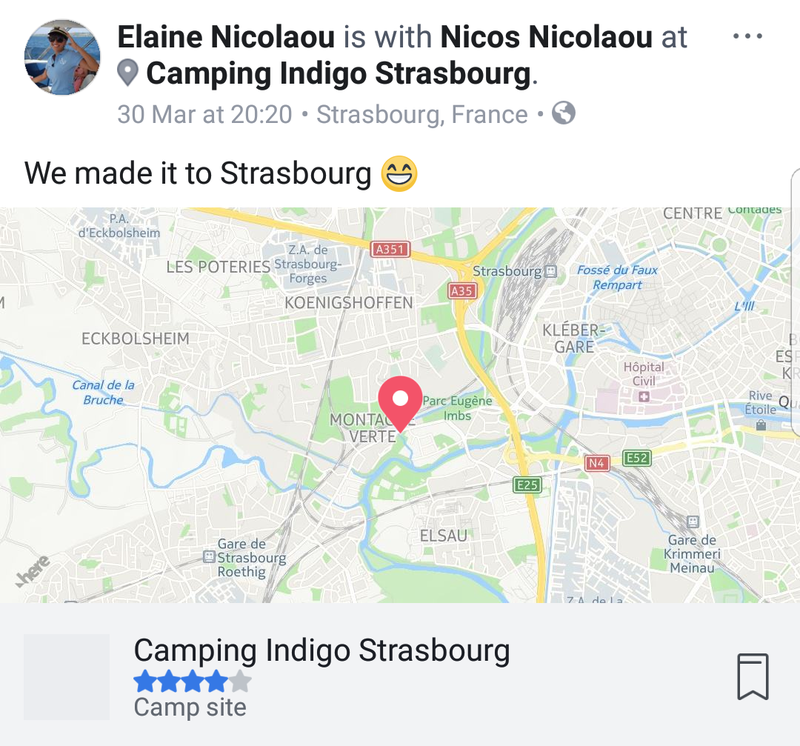 Well done Elaine and Nicos! As I said previously, a very brave thing to do but bet it’s done wonders for your confidence! Soon be in Kef. It’s been a real joy following your journey, anxiously awaiting your next episode each day! Alex tunnicliffe – I’m going to come and find you in three weeks and buy you a beer or two!! Massive respect for that journey. I love my caravan and would so love to tow it to Kefalonia!! 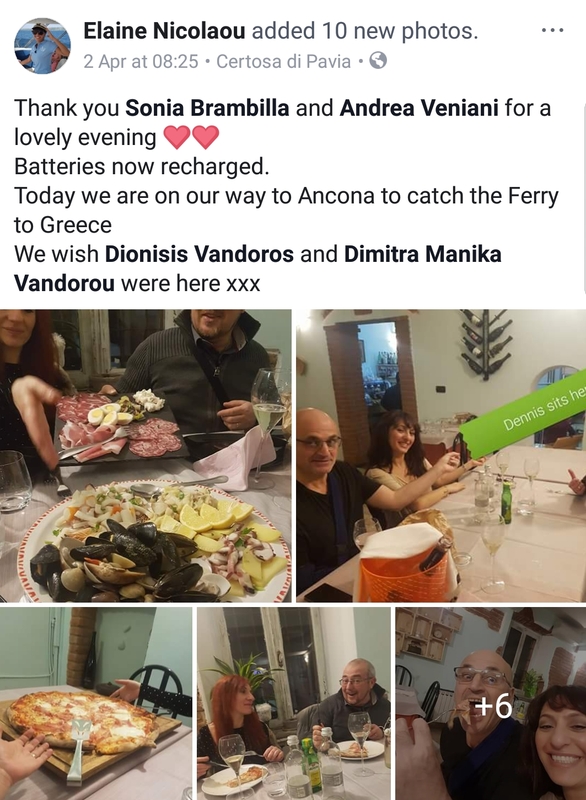 The ferry from Ancona to Patra took 23 hours. We had a cabin, so was able to escape from the very very bad karaoke and had a good night sleep. Today went very quickly. We watched the ferry stop briefly at Igoumenitsa and pass Ithaca and Kefalonia. We thought we were arriving at Patra at 5:30pm but actually we arrived at 4pm, so we were very excited and keen to disembark. And here is where the fun began! 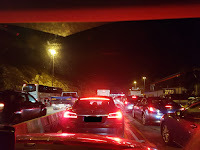 We were parked right up against the wall with a massive lorry parked in front of us. As we were leaving before him I was asked to reverse in order to give myself space to move away. I did exactly what I was told and reversed in a perfect line! But I was too close to the wall to pull away and the back of the caravan swung out and was an inch away from hitting the wall! 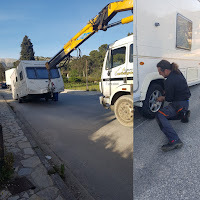 The ferry men tried very hard to direct me but in the end gave up and unhooked the caravan from the car and manually moved it! Very embarrassing!!!! 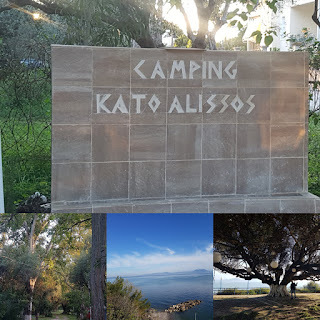 Once we got away, we had our appointment and made our way to Kato – Alissos campsite. The toilets and showers were OKish but what it’s really got going for it is the beautiful trees, the smell of the orange trees in blossom and the sound of the birds. Really really lovely. Jed Woodward – Well done to you both, if that’s the worst thing that happened then that’s a huge success! We left the beautiful campsite (Camping Kato Alissos) we stayed at, which had an amazing view of the sea and a massive olive tree, a lovely calm start to a day! We went to Patra port to be told we should go to the old port! There were no signs to the old port but we knew it couldn’t be far and we found it. Once we got there we were told where to park. Nicos instructions were much to be desired but he of course would say I didn’t follow the instructions given!! The ferry arrived and we boarded. GREAT! Once we arrived at Sami we decided to go via Agia Efimia as the road (although a little longer) was not so steep as going through the hills would be. BUT ...........we took a wrong turn and ended up on a road that was steep, narrow, had sharp U bends and no barrier! I don’t mind admitting I was trembling and driving at 15mile an hour! Eventually we found our way back on the right road and were heading for the Marina to see Dennis and the LadyO before heading to the campsite (1 mile away). We made it.....................or so we thought! All of a sudden, meters from where we were going to turn, we heard a loud bang. Looking in the mirror I saw a wheel in the middle of the road! The strange thing is ALL the nuts gave way at the same time and were meters away from the wheel. How was that possible? Nicos says ‘naturally’ the nuts would have come out 1 by 1 miles apart from each other. I don’t want to think bad thoughts that someone tampered with the caravan but Nicos thinks it’s a possibility. How lucky were we that this didn’t happen in France or Switzerland or Italy on the motorway! How lucky were we it didn’t happen on the Kefalonian hilltop in the middle of nowhere! The realisation of this made both Nicos and I cry with relief and as I am writing this I’m filling up again. We have heard so many horror stories from those of you who have done this trip and had nightmares along the way that we know how lucky we have been. 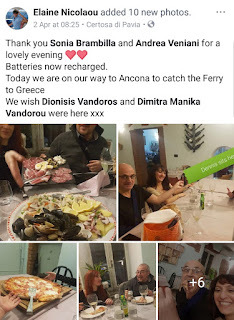 Thank God for Dionisis Vandoros and Andreas Chionis our beautiful friends. Soooooooooo many people stopped to ask if we were OK and needed help. We are now at Argostoli campsite and this will be our home over the summer months. Monica brown - Congratulations. 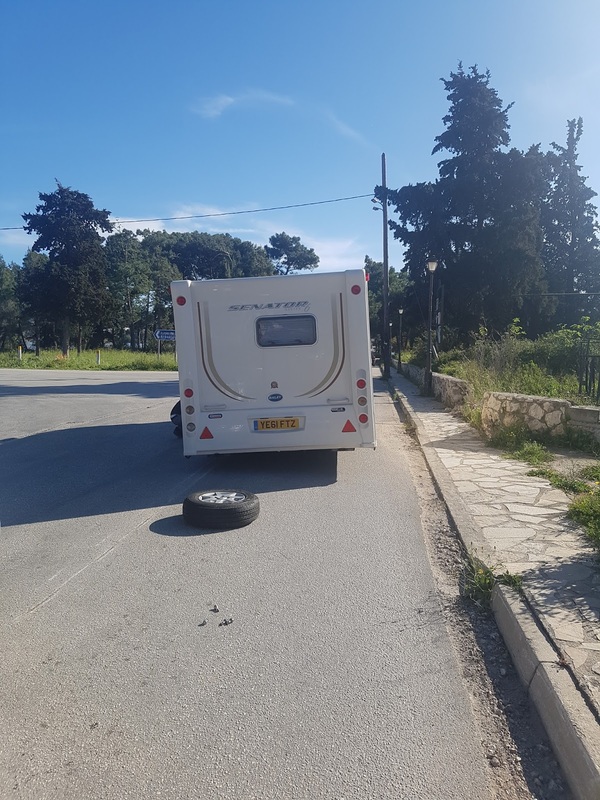 I’ve enjoyed reading your trip report so much, and have the most admiration for you driving that caravan all the way to Kefalonia Elaine. I won’t even drive on the island. Enjoy the summer both of you. You certainly deserve it. Jed Woodward – Everything is just part of the journey that you will remember forever and ever! Sue Cocksedge – You are so brave, I don’t think I could have done what you have. 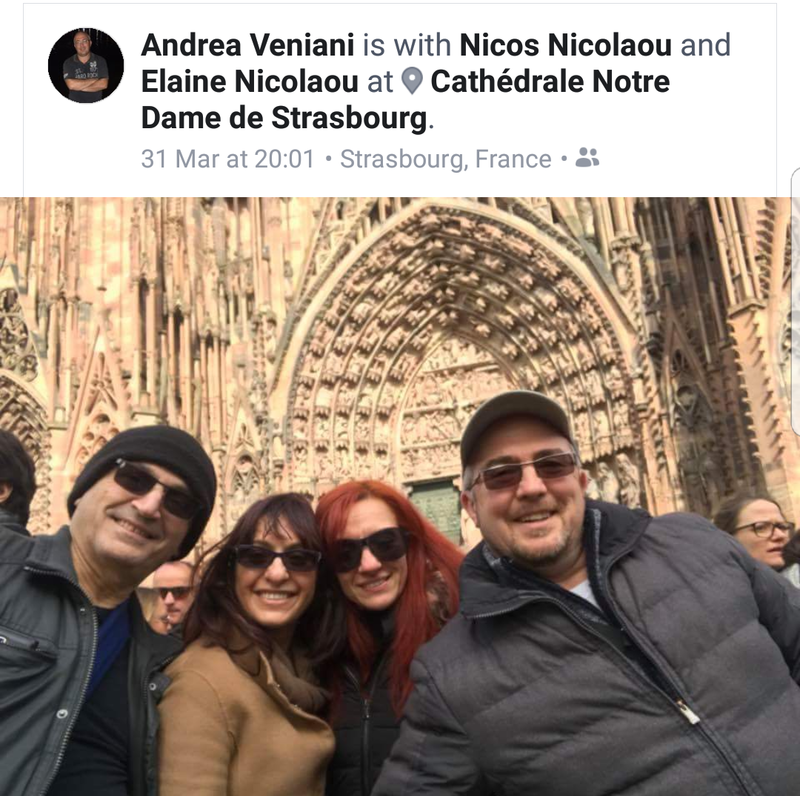 Thank you for taking us all on your trip! Now sit back and enjoy your time together. While we were making tracks through Europe Dennis and Andrea were busy dropping the Lady O into the Ionian Sea. Now the real work begins as the boys get her ready for Summer 2018. Thank you Unplugger’s and Loving and Living for coming on our journey with us. And thank you to those of you who sent me personal messages of encouragement (Mick Brunt everyday. Thank you).